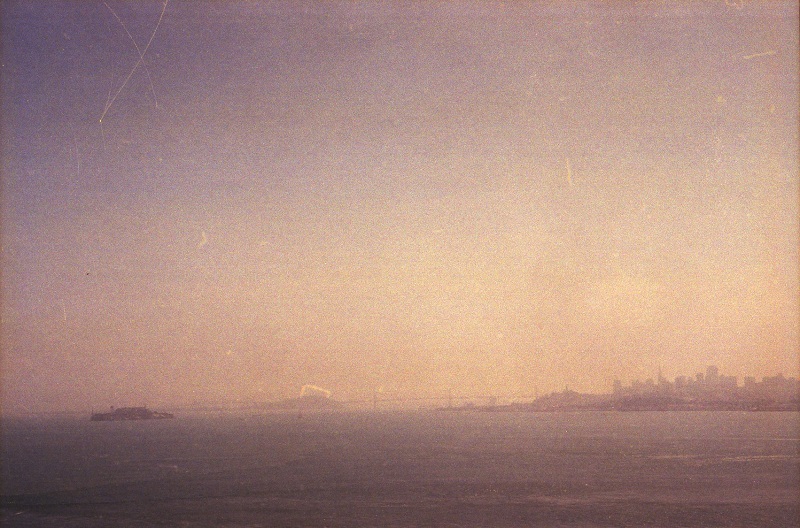 In 1998 I travelled to San Francisco and shot this truly dreadful photo of Alcatraz. If you can't make it out through the haze and scratches, Alcatraz is the dark, flattened blob at lower left. I don't think even Photoshop could improve this misfire terribly much. I scanned the original colour negative with my CanoScan, which normally produces excellent results. But you can't make an Ansel Adams out of a...an Earl J. Woods, I guess. If you look out, just past the bridge, and squint, you can see the Ogo Pogo. Hmmm... not only do I disagree with your assesment of the quality of the picture, and your ability to do anything with it in Photoshop, I also see this as a challenge to make what I can out of you shot. You'll have to do more than just fool with the histogram, although that's a start. Your composition is off because you didn't have a good long lens, so there isn't much you can do without some advanced technique. On the plus side, and this is a big plus, the colour palette is striking. I can almost see Sam Spade's office (read your Dash Hammett!) from here. Fix the histogram. There's a warm part and a cool part to the gamut. I'd split the image using masks to create separate warm and cool curves for each, and then blend them using a massively feathered boolean selection. Get rid of the scratch artefacts. Easy peasy. Make Alcatraz a mask, cut it, and paste it closer to the city. Also embiggen it with Transform. Make the city a mask and enlarge that as well. The bridge is a wash. You could find a pic of the bridge from another photo and copy it in, matching the palette. Or you could draw in a new bridge using Shapes. Scale and position the new bridge to match your new composition. Dodge the highlights in the whole image, and burn the shadows. You may have to paint in some lighteners and darkeners by hand. I would add some fictional lighting to both the island and the city. Finally, re-crop the whole thing to a longer, panoramic aspect ratio. Although you've got some sweet sky colour, you have too much sky. The hook to your image is the smoky atmosphere. If this was a clear day shot, then I would completely agree with you that the photo was a bust. Instead, there is a lot of potential in this shot, and I believe that it is a puzzle waiting to be solved in Photoshop. With your kind permission, I intend to bear this out. Also: check your e-mail! I sent you some stuff a while back I am waiting for your confirm. Jeff, feel free to play with the photo as you see fit, and I'll see what I can do on my end. You present an interesting series of challenges! I'll check my mail - I thought I'd responded, but I may be one reply behind. The Phantom Horseman of Metropolis!